It was Twitter that first alerted the world when a passenger plane landed in New York’s Hudson river back in 2009, not the mainstream news outlets. From an industry segment perspective you’d think Twitter was in competition with the likes of Facebook, but technology has blurred the edges to the extent that Twitter now competes with the general media. The best stories of the day will quickly rise to the forefront of the Twitter chatter, with people providing links to the most interesting analysis, and we each get the stories of most interest to us because we choose who to follow. 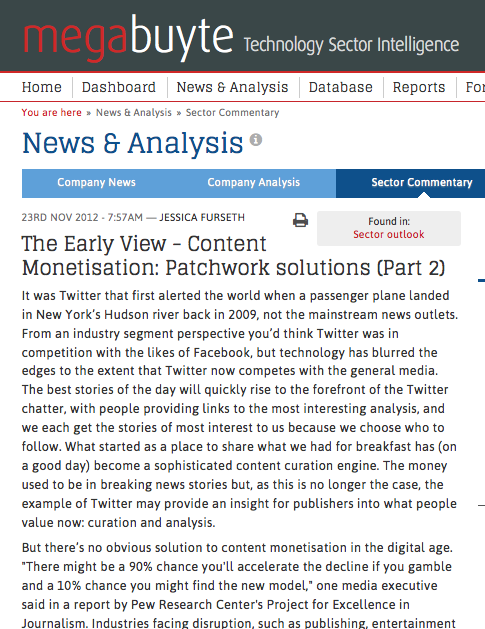 What started as a place to share what we had for breakfast has (on a good day) become a sophisticated content curation engine. The money used to be in breaking news stories, but as this is no longer the case, the example of Twitter may provide an insight for publishers into what people value now: curation and analysis. But there’s no obvious solution to content monetisation in the digital age. “There might be a 90% chance you’ll accelerate the decline if you gamble and a 10% chance you might find the new model,” one media executive said in a report by Pew Research Center’s Project for Excellence in Journalism. Industries facing disruption, such as publishing, entertainment and software, will be looking for low-hanging fruit to compensate for revenues being squeezed by an audience that increasingly expects to get things for free. In Part 1 we considered ways to make money from interesting ideas for pictures, links and advertising, while now in Part 2 we look into new variations on micropayments and freemium, plus some more unusual approaches. Paywalls and digital subscriptions are great for companies whose content is exclusive enough to make people open their wallets, however freemium is often the way to go to convince people that this is the case. Companies like Spotify (music streaming), Flickr (photo sharing), Skype (online calls) and Dropbox (cloud storage) all offer free services, making money from those who choose to upgrade to premium services. “The easiest way to get a million people to pay for a non-scarcity product may be to make 100 million people fall in love with it,” Phil Libin, CEO of Evernote, told Wired. “It’s more important that you stay than you pay. Once Evernote gets under your skin, you never want to stop using it.” The company, which provides a terrific system for saving web pages, notes, images, audio files and whatever else in online folders, has 34m users on its mobile and web platforms, of which a rapidly increasing 1.4m are paying. Libin’s method of money following love has resulted in the Silicon Valley company now planning a $1bn IPO. The New York Times, also operating a freemium model, was rewarded by circulation revenues rising by 7% last year, mainly on the back of increasing digital subscriptions. While proving to be reasonably successful in its digital transformation, cheers are subdued as by a cost base which is looking increasingly unsuitable for the new revenue structure. As the editor of a newspaper that doesn’t charge online readers anything as all, the Guardian’s Alan Rusbridger took to Twitter last month to deny speculation that the newspaper is planning to abandon print to go exclusively online, but this idea has however taken root elsewhere. Newsweek just announced it would go exclusively online after 80 years of print. This comes two years after the magazine merged with online-born publication Daily Beast, whose founder Tina Brown has since become editor-in-chief of both publications. “This decision is not about the quality of the brand or the journalism – that is as powerful as ever. It’s about the challenging economics of print publishing and distribution,” explained Brown, who intends to support Newsweek by paid subscription in the “all-digital future”. Ease of payment is key to getting people to spend on freemium services; a link to PayPal is fine for a once-a-year payment but for anything more frequent we need fewer clicks. Google Wallet stores users’ card details and lets them check out from an online retailer in three clicks, while Bango last month announced it has now integrated single-click billing into Facebook’s mobile site, so users get charged via their mobile bills. Flattr, which takes 10% of the donations, currently has about 1m users, with the average value of a click now at $0.60-0.80. Soundcloud, Wikileaks, DailyMotion and gaming site Mimecraft are among users of Flattr, which functions like a tip jar to show appreciation for a great song, photograph, software, article or other free content. But the technology could presumably be used by content creators to charge outright; you may not want to pay £30 for a year’s subscription, but one click to pay a few pennies to access interesting content is no skin off anyone’s nose. “Social, mobile and free-to-play gaming has absolutely exploded,” says Jude Ower, founder and CEO of Playmob, as we meet in the group’s offices in London’s Fitzrovia. “This has completely transformed a lot of gaming studios which were secure ten years ago, but have had to do complete rethinks around how they work.” As top gaming titles are feeling the squeeze from users circumventing expensive consoles, they are getting creative in offering new features for players, often through in-game shops. This is where Playmob comes in, as a means to improve monetisation via micropayments. Interestingly, Playmob does this by linking gamers with charities, meaning players can spend in the knowledge that some of their money go to good causes. Playmob has already raised $1.01m in investments, from Nesta, Midven, individual angels and accelerator Springboard. Our meeting took place just before last month’s official launch, but test campaigns had already raised over $10,000 for international charities. “We already operate on an international level, but we want to grow that reach. Following the launch it will be about getting more games into the system,” says Howes. Playmob’s technology is minimally disruptive, and the set-up takes just a couple of hours. The company is already working with a range of top games developers and will help them implement charity campaigns, but the goal is for this process to become automated so developers can log in and set up campaigns with their charities of choice. While Playmob’s content monetisation solution is currently aimed at gamers, the technology could also be implemented more broadly. “We could potentially take what we are doing in a virtual space and apply it in a retail scenario,” says Howes, explaining how retailers often have single campaigns donating a few pennies off a product to charity. Playmob’s technology has the potential to link these free-standing campaigns – blueberries for cancer support, water bottles for drought, sandwiches for the homeless – into a single, efficient donation platform. “While these disruptions can collectively seem like a terrifying transition for incumbents, they have also created a wealth of opportunities that are waiting to be exploited by these very same organisations,” Clayton Christensen, author of ‘The Innovator’s Dilemma’, wrote in an insightful article in the Harvard University publication Nieman Reports. One example of a company which successfully handled this kind of “terrifying” change is IBM: after starting out as a hardware and software company, declining revenues meant the group shifted its focus towards professional services and consulting. Concluded Christensen: “Faced with disruption, IBM completely redefined itself, moving away from its fading traditional businesses and leveraging the expertise of its people to capitalise on a different opportunity in the market.” The change seems to be a success: last month research house Forrester recognised IBM as a market leader in business intelligence services. In a world where Kodak went bankrupt while Instagram sold for $1bn, the message is clear: be brave, and grab the disruption by the horns. Posted on 11/23/2012 by Jess. This entry was posted in Technology features and tagged content monetisation. Bookmark the permalink.